"En Plein Air: Painting the Loudoun Landscape," assembles a group of Loudoun Sketch Club artists who share insights through their individual painting styles and techniques. 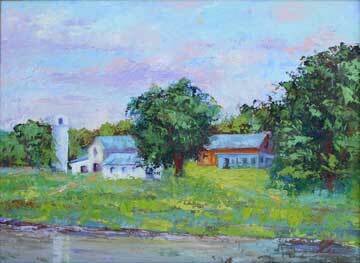 This exhibit showcases the beauty of Loudoun as it also defines the Loudoun landscape en plein air. The exhibit will be on display at the George Washington University Virginia Science & Technology Campus from May 5 through July 13, 2014 in Enterprise Hall, 44983 Knoll Square, First Floor Gallery, Ashburn, VA 20147. Free and open to the public. Established in 1944, the Loudoun Sketch Club is a membership organization for visual artists who live and paint in Loudoun County. This diverse group of painters gathers in venues throughout the area to paint plein air in a variety of mediums. Note: The paintings on display are for sale. For more information, please contact the artists directly. For more information about the exhibit please contact the Office of Corporate and Community Relations by email or by calling 703-726-3652.